Rough bumps and challenging terrain are all in a day’s work. Feeling them shouldn’t have to be. The Toro GrandStand combines the speed and comfort of a zero-turn rider with the on-and-off ease of a wide area walk-behind — creating a fast, maneuverable and more productive alternative. And now the GrandStand is even better with all-new next generation upgrades that add up to higher productivity, lower maintenance and easier service. 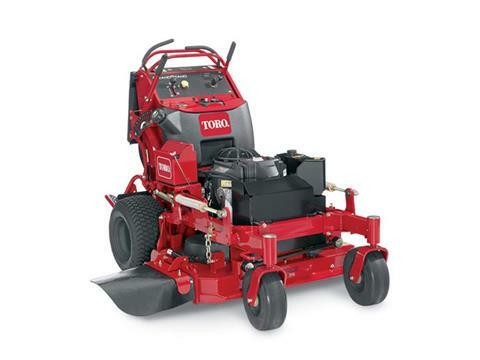 This mower has a 15 HP (11 kw) Kawasaki® engine with a 36 in. (91 cm) TURBO FORCE® deck. FATIGUE-REDUCING SUSPENSION: The revolutionary Flex-Ride operator platform suspension keeps operators fresh, resulting in less fatigue and higher productivity throughout the day. Best of all, the suspension system is self-compensating for operators of different sizes. 2-IN-1 VERSATILITY: In situations where the operator may want or need to walk, Toro's foldable operator platform instantly converts the GrandStand® to a walk-behind. When it's time to ride, just lower it back down - saving time, money and trailer space by eliminating the need to switch from one mower to another. STAND-ON MOWER PRODUCTIVITY: The ability to turn easily, get in and out of tight spaces, and quickly get on and off the mower to pick up debris or move obstacles all contribute to less time spent per property. The exceptional visibility of the GrandStand® protects the operator, the mower and the property. The operator is better able to steer clear of obstacles, identify upcoming changes in terrain and easily pass beneath overhanging branches. EXCLUSIVE TURBO FORCE DECK: High-capacity TURBO FORCE® decks deliver unsurpassed strength, a superior cut, and increased productivity in extreme mowing conditions. Equipped with a patented adjustable baffle, TURBO FORCE® decks can be fine-tuned in order to conquer changing turf conditions. THE INDUSTRY'S TOUGHEST SPINDLE ASSEMBLY: Toro's rugged spindle assemblies survive impacts that would destroy lesser spindles. The cast iron housing, with a massive 9-3/8 in. (23.8 cm) diameter base, absorbs impact loads and distributes them across a broader area of the robust deck shell. TRACTION AND HANDLING: The wide stance and optimal weight balance of the GrandStand® enhance hillside stability and control. Because there are no restrictions to limit operator motion, operators can shift weight as needed to further enhance the performance of the machine. BIG ON FEATURES, NOT SIZE: The GrandStand® conserves space to get more machines on your trailer or allows for a smaller trailer and a lighter load. And the unique, foldable operator platform makes the product even more compact for transport or storage. Some property owners have negative reactions to larger, heavier-looking mowers, and are concerned that their lawns may be damaged. With the sleeker Toro GrandStand®, that problem is eliminated. HEAVY-DUTY MUFFLER GUARD: Heavy-duty, 7 ga. muffler guard protects muffler against damage. The gross horsepower of these engines was laboratory rated at 3600 rpm by the engine manufacturer in accordance with SAE J1940 or SAEJ2723. As configured to meet safety, emission and operating requirements, the actual engine horsepower on these mowers will be significantly lower. 1 in. - 5 in. 1/4 in.